Duck Haven is an amenity-filled, tastefully decorated home located in the ocean-to-sound Tuckahoe neighborhood in Duck on the Outer Banks of North Carolina. This comfortable and well-maintained, family-oriented home in a cul-de-sac setting will have you returning year after year for a relaxing & fun-filled vacation. Upon your arrival at Duck Haven, everyone will appreciate the ease and convenience of using the exterior Stair Tamer cargo lift to deliver suitcases and groceries to the 2nd and 3rd floors by use of a remote control. Remember to look for the Duck Haven gift bag loaded with special treats from Trader Joe’s that greets you on the kitchen counter! As everyone settles into Duck Haven’s 5 bedrooms (2 of which have adjoining bathrooms), they will be pleased to find that all beds are freshly made with crisp linens and that there are 12 sets of bath, hand & face towels on hand for when it’s time to freshen up. Duck Haven is loaded with activities for "kids" of all ages, including baby & toddler gear, flat screen TVs with DVD players in all bedrooms, 42” great room HDTV with BluRay player, 50” game room TV, video library, games & puzzles, 3rd floor covered deck with 3 rocking chairs and 2 side tables, Nags Head swing & hammock, basketball goal, sports items & outdoor games and a private pool & hot tub with outdoor stereo system & pool deck lighting. Everyone will enjoy the large & secluded sandy backyard with BBQ, picnic & play areas that are lighted for night-time use. The chef will appreciate grilling on their choice of the park-style charcoal grill or the gas grill with side burner & the cook will enjoy the well-equipped kitchen and dining area which accommodates 12. Keep in touch while at Duck Haven with free wireless internet & nationwide long distance phone service. The electronic keyless entry system conveniently allows Duck Haven's guests to easily come & go while enjoying the area’s many activities. Load Duck Haven’s multiple beach chairs & your own beach gear into the two Wheel-eeze beach carts, and after a short walk to Tuckahoe’s community ocean-front boardwalk, everyone will be enjoying the sand & frothy surf of the Atlantic Ocean. It’s just minutes to the community’s other amenities including an outdoor pool with bathroom facilities, a tennis court & a pier with dock and gazebo on the gentle Currituck Sound where the kids will enjoy crabbing & everyone will be in awe of the spectacular sunsets. The picturesque village of Duck with unique locally-owned shops, galleries & restaurants is an easy stroll or relaxing bike ride away along the paved roadside path. The 11 acre Duck Town Park is a beautiful recreational facility which offers many scheduled summer activities & includes an amphitheater, playground, picnic shelter, gazebo and a public kayak/canoeing launch in addition to the many walking trails through the maritime forest & a mile long sound-front lighted boardwalk. Convenient shopping is nearby with supermarkets (Harris Teeter & Food Lion) pharmacies (CVS & Rite Aid), Walmart & Home Depot located less than 5 miles from Duck Haven. Duck Haven guests are welcome to participate in the K-Club Amenity Program which offers access to first-class amenities at the Kilmarlic Golf Club, which is located less than 13 miles from Duck Haven, including discounted golf rates, instructional clinics, access to club dining and shuttle service to the Club from Duck Haven. The K-Club also offers Duck Haven guests special rates for exciting sports experiences in hang gliding, kiteboarding, jet skiing, surfing, paddle boarding and more with Kitty Hawk Kites, wild horse tours with Corolla Outback Adventures and Jeep rentals. And to ensure that your Outer Banks vacation at Duck Haven is memorable, the K-Club has a full time concierge to assist with planning your activities. So pack less, relax more and enjoy the many comforts & pleasures of Duck Haven! About Beach Realty of North Carolina, Inc.
Our diverse family members include an interior designer, a landscape architect, a real estate office manager and a home improvement contractor. 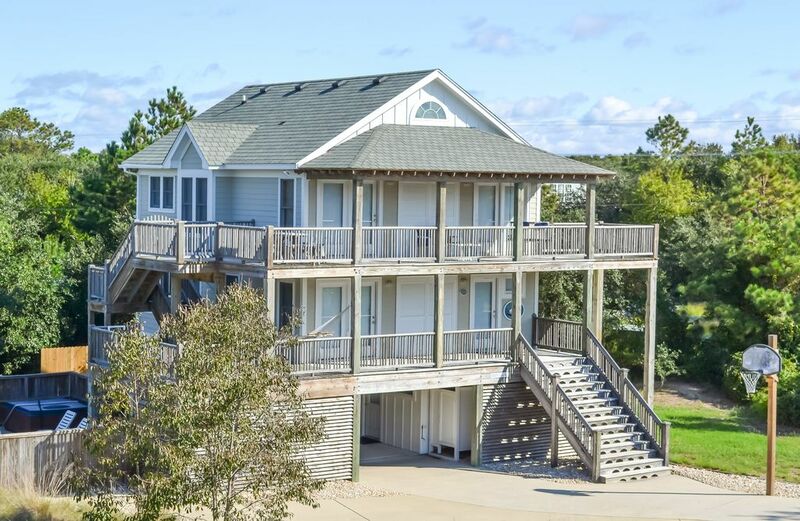 We take great pride and pleasure in providing our guests with a comfortable, clean, well-maintained and amenity-filled vacation home that will provide lots of fond Outer Banks memories. We chose our Duck beach home because of its convenient location in the ocean-to-sound Tuckahoe community which offers private access to & private parking at the ocean beach boardwalk, the sound-side community pool, tennis court and pier & dock. The family-oriented Village of Duck with shopping, restaurants & outdoor activities is just a short jaunt from Duck Haven along the running/walking/bike path. View more about Beach Realty of North Carolina, Inc. The vacation rental was clean. Good value for the price. Didn't like the off white carpet, also the bathrooms and floors could have been cleaned better. Mirrors were dirty. Had a plumbing problem lst day there with the bathroom on the 1st floor slug coming out of the bath tub drain. Called the rental office and had to leave a message no return call. We had to purchase liquid plumber for the drain. We finally decided to go to the rental office and tell them of the problem they said they would contact the plumber and he would be there the next day. The next day he didn't show up. Call rental office again and they sent a different plumber the next day. The also said they would reimburse us for the liquid plumber which they did not do. Kitty Hawk Rentals apologizes that our vendor did not come to your home as promised to take care of the hair clog in the bath tub. I do see that the second plumber called did go to the house and fixed the clog. Kitty Hawk Rentals certainly does not wish any guest to start their vacation with these types of issues. The cleaning matter you reported will be sent directly to our Housekeeping Manager for retraining of cleaning vendors and inspectors on this type of issue. Kitty Hawk Rentals welcomes your family back to stay with our company for vacations in the future. We had another great vacation at Duck Haven. The weather was very warm so the pool was utilized every day!!! We also took the short walk to the beach where everyone enjoyed themselves. The house was big enough for the 12 of us, which includes 2 small children. The baby gates and crib/pack n play were a blessing. This was our 2nd trip to this house in 5 years, and both were wonderful family vacations. "Another Great Vacation" is so great to hear about any property with Kitty Hawk Rentals. The owner of this property works extremely hard and always be focused on having everything for the guests just right for a relaxed and memory making vacation. This house is in a community that has community pool, access to the sound and ocean access which are also great amenities. Not to mention the close distance to Duck Village for walking, biking or car of course to check out all the great restaurants, shops and things to enjoy like the great sound side boardwalk spanning Duck Village. We look forward to having your family join us again for another vacation at "Duck Haven". The owners of this property thought of everything.Not only was the kitchen well equipped but everything was labeled as to where it belonged. The cargo container was especially helpful! Everyone enjoyed the assortment of games and of course the pool. This property was amazing. Breach Realty went above and beyond to make our vacation a great one! "Amazing Accommodations" is a review that Kitty Hawk Rentals and our owners wish to receive each time a guest departs from their vacation. The cargo carrier is the best for groceries, luggage and anything heavy to climb stairs carrying. This owner takes great pride in the property and the home, making sure every guest finds all the amenities offered refreshing and making their vacation so enjoyable. We look forward to having your family return for many more vacations at "Duck Haven". We had a wonderful stay with our children and grandchildren at Duck Haven. This home is well-appointed; it has comfortable large and airy rooms. APPRECIATED: home instructions; pool; lift; beach toys/chairs; welcome package; linens & towels; washer/dryer; kitchen/appliances; TVs; comfortable beds. UPON ARRIVAL WE DID NOT APPRECIATE: 2 smelly completely full garbage bins left in the car port from previous renters that we had to dispose of 2 days later on garbage day; no toilet paper in any of the 3 bathrooms; no dishwasher or dish soap; no paper towels; no Kleenex tissues; no kitchen dishcloths. Our suggestion to the owners is that they forgo the Welcome Package of goodies but assure that there is a starter supply of the above-mentioned articles in the bathrooms and kitchen. It is not always possible to assure a timely arrival by plane/rental car after the 4 p.m. check-in and before local stores close to purchase items such as toilet paper, etc., for the next day. Lacking such basic items was terribly inconvenient upon arrival. NOTE: Before our departure, we assured that the above-mentioned items were left for the next renters of Duck Haven hoping that the cleaning staff would not take them before the renters' arrival. Kitty Hawk Rentals appreciates all your comments and suggestions on what should be in a home upon a guest's vacation. Kitty Hawk Rentals does email our guests lists of items which we suggest you bring or be aware that will not be completely supplied at any of our rental homes. We will certainly pass along your suggestion to the owners about their gift bag contents. We look forward to having your family join us again for any future vacation here on the Outer Banks. A delightful home for a Family Retreat! Our family of 10 had a wonderful stay. The two decks, pool and sandy outdoor game area provided plenty of extra space for everyone to spread out. Just a ten minute walk to the beach and 15 minute walk into town made Duck Haven an ideal location. Day trips to the Currituck Lighthouse in Corolla; the Wright Brothers Memorial in Kitty Hawk and Bodie Lighthouse in Nags Head proved to be fun and informative excursions as well. The house was well organized and thoughtfully equipped with everything we needed. Expandable toddler gates at the top of each set of stairs was greatly appreciated to keep our little ones safe. Our family also enjoyed shady morning runs, tennis matches and bike rides. A shout out to "Tree House Coffee and Rope Ladder Kitchen" for wonderful breakfasts! Thank you Cartwright family for taking such good care of your guests. We are already looking forward to a return visit! "Duck Haven" is as you comment "a delightful home for a family retreat. It is so accommodating for gathering for meals or just wanting a quiet place to read that book you brought along. The owners are always making sure that their guests really find the house full stocked and very well maintained for their enjoyment during their vacation. The amenities for the community are certainly a plus and very close by the home as well. We look forward to your family joining us again here on the Outer Banks for future vacations. The size and location fit our family needs. The king/queen size beds plus 2 bunk beds provided comfortable sleeping arrangements. The kitchen had a large assortment of dishes, pots and pans plus many appliances allowing us to prepare large meals easily. The pool was a nice size and was clean with ample chairs, tables and some inflatable toys. We enjoyed the easy access to the beach, sound and town of Duck. The house and furnishings were well maintained, but appeared to be cleaned quickly before turn over from the last group of visitors. Having sheets and towels provided was a plus, unfortunately the dish towels were missing and there was no toilet paper when we arrived. The shaded top balcony was our favorite. The traffic noise from route 12 could be heard outside, but was something we got used to hearing. The neighborhood itself was very quiet and friendly - even the deer that visited daily! I'd recommend this property to families wanting a casual, comfortable stay close to the beach and town of Duck. Kitty Hawk Rentals is pleased to learn the your family found "Duck Haven" to be quite comfortable and well equipped with the necessary amenities for a vacation. Certainly having sheets w/beds made and towels provided on your arrival is a great pleasure when coming on vacation. The community does have a nice community pool as well as access to the sound and just a short distance to the oceanfront as well. Please joint us again for many more vacations here on the Outer Banks. LadderBall, Horseshoes, Sandy Backyard BBQ/Picnic/Play Area, Bird Watching, Rollerblading, Skateboarding, Jogging/Walking/Bike Paths in Duck; Duck Village Park; 4-Wheel Drive Rentals & Beach Driving; All Types of Fishing (Deep Sea, Pier, Surf & Sound); North Carolina Aquarium; Wright Brothers Memorial; National Wildlife Refuge; The Outer Banks Center for Wildlife Education; Outer Banks Lighthouse Tours; Lost Colony Outdoor Amphitheater; Historical Tours; Wine Tastings; Free Ferry to Ocracoke Island & much more. **Weekly rental rates are based on the property's turnover day. If your initial quote does not match the bookable quote, please change your arrival and departure to either Saturday-Saturday or Sunday-Sunday (depending on the property). Optional Fees: Pet Fee: Properties permitting dogs will have a fee ($150.00 plus tax unless otherwise noted) for the privilege. Heated Pool Option / Early Check In: (if applicable) Fees vary, please contact Kitty Hawk Rentals for a quote.